Welcome to what will hopefully be the beginning of a weekly feature showcasing what’s happening in the shared universe of United Trek. Find out what stories are currently underway, what has recently been added and updated and other news relating to the United Trek universe. All in one convenient place. United Trek welcomes Brydon Sinclair to the United Trek universe. His Silverfin series has been a part of the shared universe for a while but now it’s finally official. Bry will continue the great legacy of the Border Service created for the UT by recently retired TheLoneRedshirt. Silverfin’s latest story, Bright New Day is being posting at the TrekBBS and adds another exciting chapter to the United Trek event Refugee Crisis and brings back one of the most fascinating characters from Star Trek: Voyager. DarKush brings us a new and revised version of his riveting political/spy thriller Shadow Puppets which is being posted at the TrekBBS. His story explores the question of what length both the Federation and the Romulans will go in order to keep control of Benzar after the end of the Dominion War. Michael D. Garcia and writing partner A.J. Gertner have been hard at work at revising and re-shuffling Full Speed Ahead to make a great series even better. The latest chapter, A Great Perhaps is now complete and available at Ad Astra. FSA also returns to the TrekBBS with story #4, Milk Run. Don’t miss any it. And check out the Full Speed Ahead blog to keep abreast off all FSA news. The Task Force Vanguard headline tale continues in Scorched Earths by Sam Redfeather in his second, mind-blowing adventure of a desperate Starfleet fleet trying to head off a seemingly unstoppable convoy of refugees racing towards the Alpha Quadrant. And now their most dangerous foe might already be in their midst. A must read at the TrekBBS and Ad Astra. The God Particle continues at the TrekBBS and Ad Astra, telling the story of the rookie captain of the Agamemnon, Amaya Donners, and her seemingly impossible mission to keep the powerful Omega Molecule out of the wrong hands. Also, check out the fifth installment of The Star Eagle Adventures, Shadows in the Haze, and the return of Captain Owens, Commander Star, the USS Eagle and her crew in this mystery/crime novel now posting at the TrekBBS and Ad Astra. And for the first time ever, read the Writer’s Commentary at the United Trek forum. 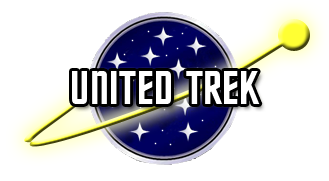 Work is underway to get the entire library of nearly 200 United Trek stories in one easily accessible archive. Keep an eye out for the complete UT history available for your reading pleasure later this year.